The other day I was talking to one of my sons on the phone and he asked me what I was doing for “work” in addition to my coaching business. Bless his heart… he was under the impression that the number of hours I work per week is based on how many one-on-one coaching clients I have at the time. You know that’s not the case… I know that’s not the case…. And now he is oh-so-very much aware of the many of hats I wear in order for my business to run smoothly and successfully. It’s e a s y for me to work 40+ hours per week on my business… not to mention all of the other roles and tasks I manage in the other aspects of my life. Oh friend… It’s a lot. And managing it all can feel so overwhelming. I get it. I have been there and I help so many women with this struggle each and every day. I wish I could tell you that there is a magical 5-simple-step program to unraveling the tangle of tasks and to-do’s and people/things that need all of you that are making you want to pull your hair out right now. From my experience, it took time to get you into the chaos you’re experiencing right now and it will take a little time to get out of it. But it IS possible to tame the to-do’s, I promise. You really can begin to set your pace, establish your priorities, and have enough time to give your people what they need (and give YOU what you need, too). We all have the same 24 hours in a day, you know? 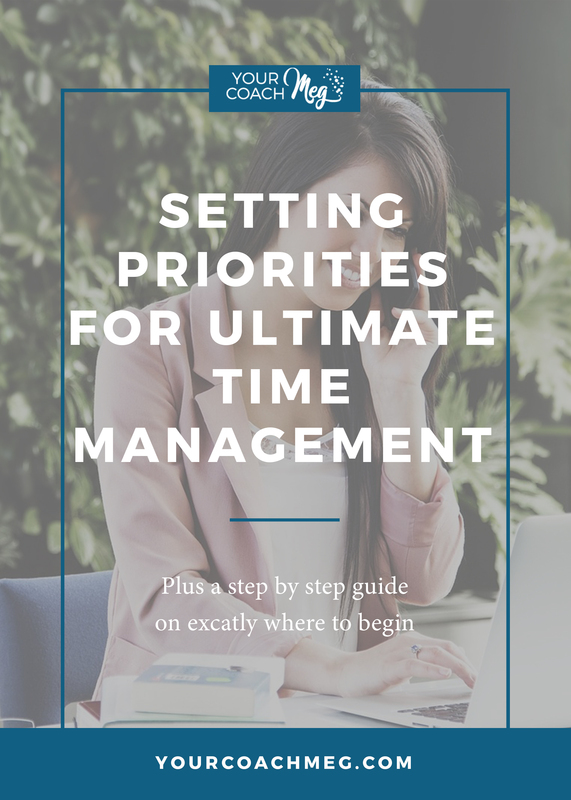 To be honest, the best place to begin to work on your time management is to know what your core values are. 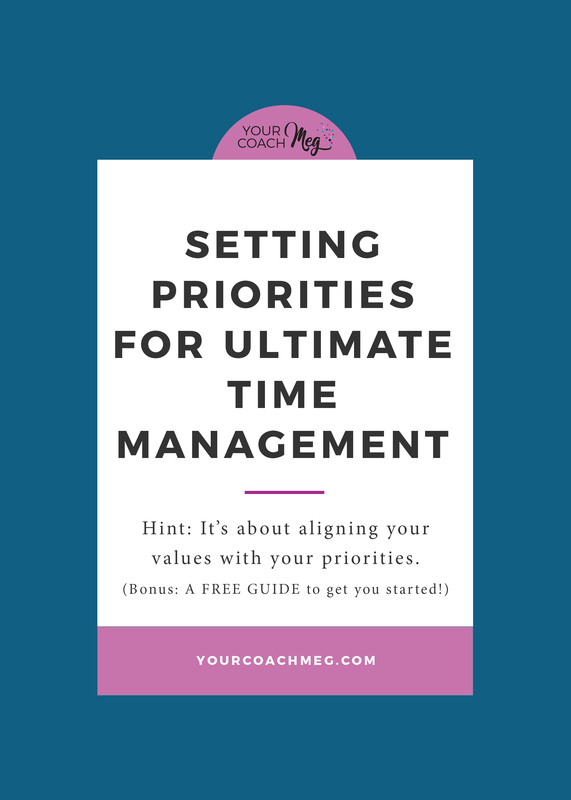 Need to learn more about your values to begin to align them with how you are spending your time? Read this blog post and download my FREE guide to Defining Your Core Values to change your life! To begin this process of getting a better handle on how you are spending your day-to-day life, it works best to list and categorize everything you do in a given day. The following are the four categories I want you to divide all of your to-dos, tasks and hats into. This is an event or task that YOU must do. It could be anything from a doctor’s appointment, to picking up a child from school, daily meditation, or meeting. Really scrutinize each item you put on this list to make sure it is 100% all about YOU and not something that someone else can possibly tackle. A low value event or task is one that you could do like read a good book, watch television, Netflix binge, or study. These are typically self-care types of events or tasks that needs to exist to live a balanced life, but they aren’t necessary for taking up the bulk of your day or week. This is my absolute favorite category, if I’m being honest, and it’s the one that so many of my coaching clients struggle to fill up. I find it liberating to know which events and tasks I can entrust to others and then begin the process of gently handing them over. Personally, this list can include tasks such as house cleaning, laundry, errand running, or landscaping. Professionally, this can include hiring a virtual assistant or personal assistant to perform any tasks that you do not need to take care of personally. 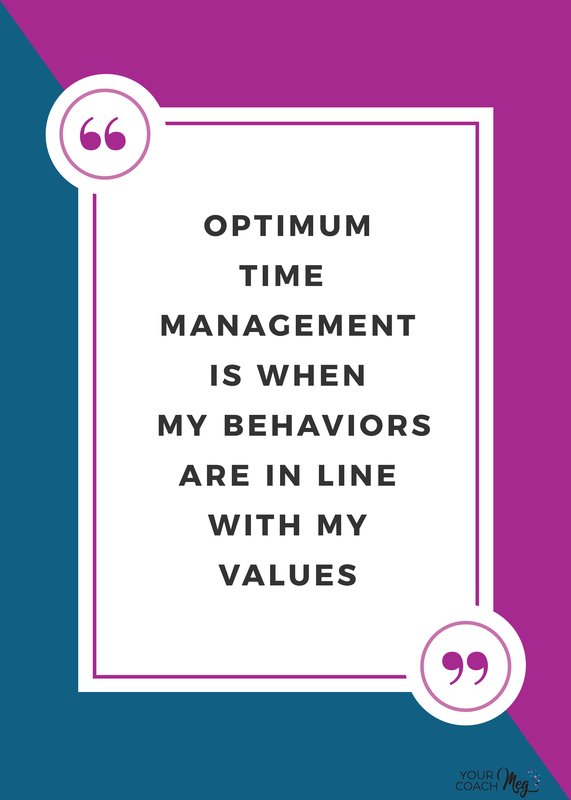 When my behavior is in line with my values. What we realize when we take the time to look at everything we do (like watching television or talking to our spouse) from this high-level view, is that we sometimes spend more time watching television that spending time with our spouse! I need you to hear me today that WE CANNOT MAKE UP TIME! Once time is wasted, we cannot get it back. 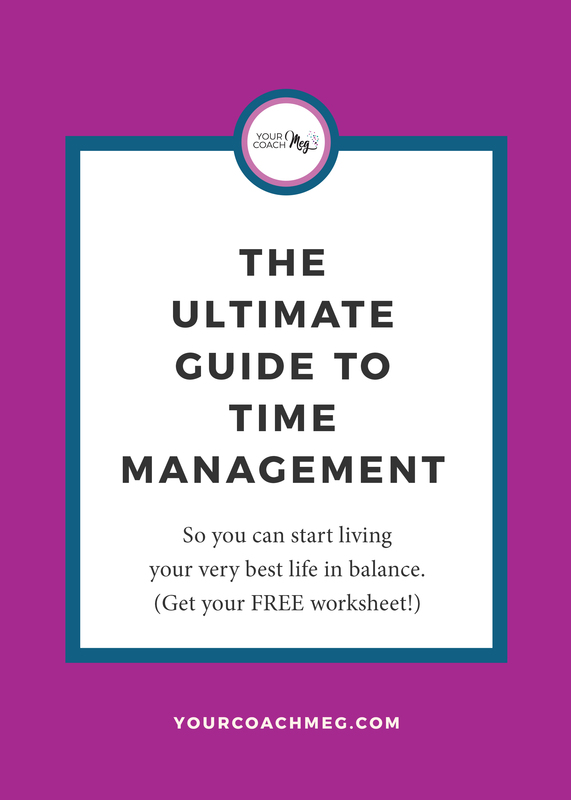 All of this and more is in my free Ultimate Guide to Time Management.